Around 20 people slept outside the BBC on Oxford Road, Manchester last night to oppose new legislation that would criminalise squatting. An amendment to the Legal Aid, Sentencing and Punishment of Offenders Bill which will be read in the House of Commons today, Tuesday 1 November, will make it a criminal rather than civil offence to trespass in an empty residential property. Campaigners also visited the constituency offices of Lib Dem MPs Mark Hunter (Cheadle Hulme) and Andrew Stunnel (Hazel Grove), leaving messages explaining the effects of homelessness on squatting. According to the Manchester Evening News, there are over 100,000 people on the waiting list for social housing alongside over 50,000 homes standing empty in the Greater Manchester region in 2009. Homeless charity Crisis also opposes the new laws. A recent campaign email from the charity pointed out that the Legal Aid Bill amendment includes buildings which are “totally derelict”, stating that Crisis was “concerned that homeless people will end up in prison for simply trying to put a roof over their heads”. The charity has asked for an extra amendment to the Bill to exclude from the law persons who have been registered homeless in the previous year alongside people who are registered as ‘at risk’ or a ‘care leaver’. Last month 160 leading legal figures wrote an open letter published in the Guardian explaining that under Section 7 of the Criminal Law Act 1977 it is already a criminal offence to squat someone’s home. Over the past three months the government has undertaken a consultation, “Options for Dealing with Squatters”, which came to an end on 5 October. 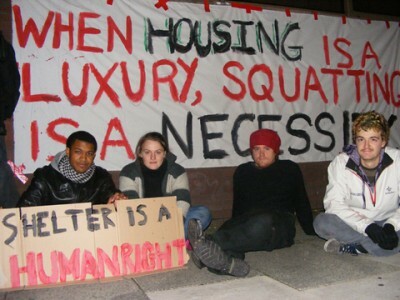 The campaign network ‘Squatters Action for Secure Homes’ (SQUASH) have accused the government of “ignoring the consultation” by rushing through anti-squatting laws only three weeks after the consultation has ended. According to SQUASH, 90 per cent of responses to the consultation argued against taking any action on squatting. Of a total of 2217 responses, 2126 were from people concerned about the impact of criminalising squatting. The consultation response itself recognised how “the statistical weight of responses was therefore against taking any action on squatting”. Squash campaigners have also accused the government of bypassing democracy by trying to “sneak through” the legislation. They say that the Amendment to the Bill was only announced early last week, not allowing sufficient time to raise public awareness about the effects of the proposed new laws. In London, around 13 people were arrested in Parliament Square last night for attempting to sleep out there. Around 200 homelessness protesters had gathered but were kettled by police. Arrests were made for breaches of the Serious Organised Crime and Polce Act – a controversial law relating to protests around Parliament which is currently being repealed. The sleep out in Manchester ended around 6am this morning.